Medical Marijuana for Back Pain: Does it Help? If you’re suffering from back pain, medical marijuana may be a much safer option than OTC or prescription pain medication. Long-term use of pharmaceutical painkillers can have some serious lasting consequences including addiction, liver damage, an imbalance of brain neurotransmitters, and more. But marijuana has not demonstrated such significant side effects. In fact, most patients have only reported a complete relief of their pain! Using medical marijuana for back pain may be a good idea if you’ve found yourself relying on painkillers to get through the day. Medical marijuana comes in a variety of strains with varying THC and CBD strength. Strains with low or absent THC will allow you to mostly avoid the psychoactive properties while still harnessing the full range of therapeutic benefits for reducing back pain with cannabis. Is Marijuana Anti Inflammatory and How Does It Work? Yes! A recent scientific review found that the anti-inflammatory properties of marijuana are more than 20 times stronger than aspirin and twice as strong as hydrocortisone. Marijuana has been used medically for thousands of years. It is only in the last century that it has been unfairly maligned with harmful drugs. The active chemical components of the marijuana plant are known as cannabinoids, which provide an array of therapeutic effects to the human body. These compounds work directly with the bodies endocannabinoid system which is directly responsible for pain and inflammation. With half of America now legalizing marijuana in some form, patients across the country are beginning to rely on medical marijuana for chronic back pain and more. According to patients, cannabis offers better pain relief than dangerous prescription pills. While cannabis is not yet available in Ohio, legalization is expected by September 2018. Medical Marijuana Strains for Back Pain: Indica or Sativa? When you buy medical marijuana for back pain, it’s important to note that not all strains of cannabis are the same. In general, there are two types of cannabis: indica and sativa. 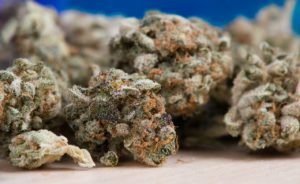 While there is a lack of scientific evidence that backs these claims, most medical users believe there’s a significant different between indica and sativa. Indica strains are often the most popular for conditions involving pain and anxiety. On the other hand, sativa is said to be more energizing. If you’re suffering from back pain, an indica variety may be a good first option. What About CBD to THC Ratios? In addition to medical marijuana strains, there are also varying degrees of active therapeutic chemicals in a marijuana plant. The two primary chemicals: CBD and THC have completely different effects. Some plants are higher in CBD than THC and some may have higher amounts of THC. If it’s your first time, you may want to start with a product that is low in THC and higher in CBD. If it doesn’t work – don’t be discouraged. Patients often must try multiple strains and types of marijuana before they find one that works best for them. Will Medical Marijuana Make You “High”? A common question asked by patients suffering from back pain and who are interested in medical marijuana is if it will make them “high”. If you’re wondering “will medical marijuana make me high”, the answer is: it depends. First, let’s clarify what being high means. High is a slang term used to describe being under the influence of marijuana. A high occurs when THC, the primary psychoactive component of medical marijuana, is inhaled, digested, or absorbed through the skin. The specific effects can take a few seconds or up to a few hours, depending on the delivery method. Once the THC is in your body, it activates certain areas of your brain, leaving you with a euphoric-like feeling. Some patients describe it as a pleasant and calming experience, that gently fades away over the course of a few hours. When you’re under the influence, it may increase your hunger and thirst. And it often enhances or influences your 5 senses including vision and taste in some way. The intensity of your experience depends on how much cannabis you have consumed, which is why it’s important to start off slow. Now that you understand how medical marijuana works and what to expect, let’s return to the original question: will medical marijuana make you high? If the cannabis has THC, then the answer is yes – you may feel the psychoactive chemicals depending on how large your dose is. In some cases, the effects are so mild that you can continue your day without it negatively effecting you. Higher dosages may leave you feeling tired and unable to do much more than sleep or lay on the couch. And some patients prefer this as it helps them manage their pain. On the other hand, some forms of medical marijuana are higher in CBD and contain little to no THC. In this situation, you likely won’t feel any psychoactive effects. Unfortunately, if you do decide to get a medical marijuana license in Ohio, you’ll likely need to responsibly experiment to determine which form of cannabis works best for your condition. Platelet-rich-plasma, or PRP, has a wide range of uses in pain management. We have had success with PRP in patients with arthritis, sports injuries, tendinitis and even old sprains and strains that never had a chance to heal correctly. Injections with a high concentration of platelets help to kick-start healing in new injuries or reboot the healing process in old injuries. PRP is low-risk. Because PRP therapy uses your own blood, there is no risk of infectious disease and low risk of a negative reaction from your immune system. PRP is an excellent option for athletes and other active people who want to get back into their routines quickly.